Legend says that one of the disciples of Buddha, Maudgalyayana (Mokuren in Japanese), who had the power of talking with ghost and gods, once had a vision of his mother after she died. He saw her in the “Realm of Hungry Ghosts", suffering from hunger and thirst. Grieving, he went to Buddha asking him how he could help her. Buddha told him to give offerings in the 15th day of the 7th month, and after following his advice, the disciple saw again his mother, this time at peace. 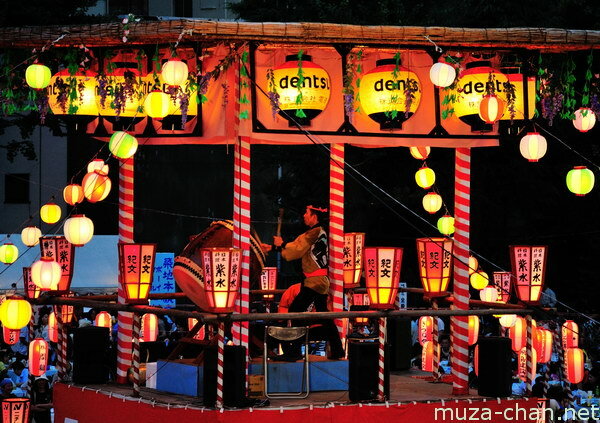 This Buddhist legend was the beginning of the Bon Odori dances, a tradition taking place in mid-July or August, depending on how the 7th month is calculated in the region. Photographed here is a Bon Odori stage at the Tsukiji Hongwanji temple, Tsukiji, Tokyo.